UCF has developed a comprehensive FTCE Elementary Education K-6 Review Program to empower teaching professionals and prospective students with the knowledge to successfully pass the FTCE Elementary Education K-6 exam's Language Arts and Reading, Social Science, Science and Mathematics sections. 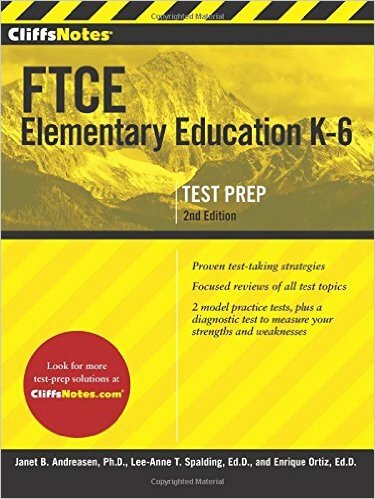 Our FTCE Elementary Education K-6 Review Program is taught by professional educators who are able to connect with the class to convey important test information and explain test-taking strategies that are easy to remember and apply. In-class option: Meet at our UCF Continuing Education building in Orlando, FL. Online option: Login to view the live online sessions streamed during Eastern Standard Time. You will be able to hear the instructor lead the course discussions, view the course handouts, and engage in an online chat discussion with students and your instructor. Erin Mander is currently the president of a curriculum consulting company that services a number of private institutions in Orange County. She taught in the middle grades for eight years while earning her Masters degree from the University of Minnesota with an emphasis in Curriculum and Instruction. Beyond leading this company, she has a doctorate in Curriculum and Instruction from the University of Central Florida. Her passion is equipping professionals with the tools needed to make a lasting impact on students. She is a state certified teacher in Florida and in Illinois. Erin is the lead instructor/facilitator of the FTCE General Knowledge, FTCE Professional and FTCE Elementary Education K-6 Review Programs. Tammy Powell is a UCF graduate, a certified teacher who has been working in education in Orange County for sixteen years, and as of 2015 graduated with a masters degree in Mathematics Curriculum and Instruction from Concordia University. Currently a fifth grade teacher, Mrs. Powell has taught elementary, middle, and high school, specializing in math and science. She is certified by the State of Florida in K-6 Elementary Education, 5-9 Mathematics, and 6-12 Journalism. Mrs. Powell currently teaches both the FTCE General Knowledge Mathematics and the K-6 Elementary Education classes and works as a math and science tutor for Mastermind Educational Consultation. Her goal in the classroom is to make even the most difficult concepts easy to understand while using thorough preparation to overcome the test anxiety that many adults experience. Tammy is the instructor of the FTCE General Knowledge and FTCE Elementary Education K-6 Review Programs. Students are responsible for purchasing their own copy of the textbook. How do I become a Florida Certified Teacher and which exam should I take first? Visit www.fldoe.org/edcert or call 1-800-445-6739 to speak with a Certification Specialist. Is the textbook included in the FTCE review course fee? No, the textbook needs to be purchased separately. All textbooks can be purchased at most national or local bookstores or from online suppliers. How do I register for the FTCE Exam? UCF Continuing Education only provides test preparation review courses for the FTCE exams and does not administer the actual exam. Please visit the links below to get more information on how to register for the FTCE exams. Visit www.fl.nesinc.com to register for the appropriate exam. I just wanted to say THANK YOU once again for providing all the material that I needed in order to pass the Elementary Education Certification Exam. I passed the Science section last week!! WOWHOOOO!